Mo Farah is set to compete in the World Half Marathon Championships in Cardiff as he prepares to defend his Olympic titles in Rio this summer. The 32-year-old, who won gold in the 5,000m and 10,000m at London 2012, has made himself available for the British team for the race, on 26 March. "It will be a good chance to try to claim another world title," said Farah. Organisers said Farah's appearance was a "major coup" for the event, which hopes to attract 25,000 runners. British Athletics will name its team on 7 March, with Farah hoping to race at the championships for the first time in his glittering career. "I know the standard is incredibly high with athletes who really target and train specifically for the event, so I know it will be a hard race," said Farah, the British and European half marathon record holder. "I always get amazing support whenever I race in the UK and I hope this will help me along the way." Farah began the Olympic year by competing at the Great Edinburgh Cross Country, where he was beaten by American Garrett Heath over the 8km course. 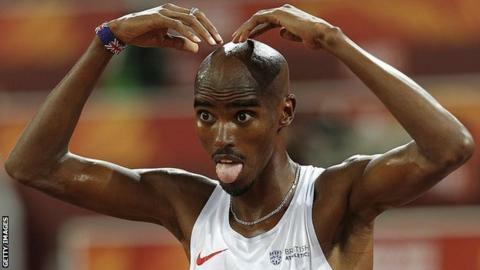 Organisers of the World Half Marathon have long lobbied Farah to make himself available, and he believes the course in Cardiff will help his ambition to become the first man since Finland's Lasse Viren in 1976 to win successive 5,000m and 10,000m Olympic titles. "My primary aim for 2016 is the Olympic Games in Rio in August but this race will be a good way to build my endurance before I return to the track in the summer," he said. The IAAF Half Marathon Championships are being hosted in Britain for the first time since 2009, and for the first time in Wales. As well as the world-class athletes who will compete in the elite races over 13.1 miles (21km), the event will also be open to amateur runners of all ages. "Mo's appearance has always been a key ambition for us and this news will give a huge boost in the final nine weeks of preparation," said Matt Newman, chief executive of race organisers Run 4 Wales. "The Welsh public will get a rare chance to witness one of athletics' global stars competing around their capital city." The 2016 World Half Marathon route will finish in the civic centre, unlike the 2014 Cardiff Half Marathon course which ended outside the Royal Welsh College of Music and Drama.